The green and glorious calm among the ruins of one of England’s most powerful monasteries, or a breathtaking view across the Vale of York to the Pennine hills. destinations to be enjoyed as a bigger and better Sunday and Bank Holiday Moorsbus network takes to the roads in North Yorkshire this Sunday. Thanks to the backing of its passengers and local parish councils, and in association with Ryedale Community Transport, a new direct bus service will pick up train passengers from York or further afield at Malton railway station and take them on a day out to remember in the North York Moors National Park. Also new is a frequent shuttle bus service between Helmsley and the impressive yet tranquil ruins of Rievaulx Abbey, hidden deep in the River Rye valley – and three new journeys between Helmsley and Sutton Bank can be savoured on a walk or cycle ride. Direct buses will link Darlington, Stockton and Middlesbrough to the heart of the Moors at Danby and Pickering, including an interchange facility at Guisborough providing access to the full range of Moorsbus destinations. Moorsbus will also link Saltburn, Redcar, Stokesley, Northallerton railway station and Thirsk with Byland Abbey, Helmsley and Bilsdale. 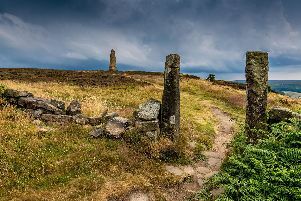 Helen Gundry of the Friends of Moorsbus said: “These services bring hundreds of visitors into the area, many of whom either don’t have a car, or want to take a linear ‘buswalk’ in the Moors.